Junior Walker was a bit of an anachronism when he started recording at Motown in 1964. 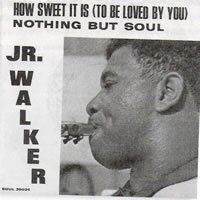 Instead of the slick, highly commercial soul that was Motown’s trademark, Walker’s wailing sax harkened back to the early days of R&B and echoed some of his early inspirations such as Louis Jordan, Big Jay McNeely, and King Curtis. Jr. Walker & The All Stars, however, were the perfect fit for Berry Gordy’s new Soul label. Soul was the Motown label created to compete with Stax-Volt’s emerging line-up of soul singers, and Walker’s gritty sax had just the sweaty, funky sound that Gordy was looking for to anchor his newest label experiment. Junior was born Oscar Mixon in Blythesville, Arkansas, in 1931. He is also known as Autry DeWalt Jr. Motown further confused the issue when it cut eleven years off his age after his records began to sell in 1965. Junior got his ‘Walker’ stage name after his family had moved north to South Bend, Indiana. He claimed the kids started calling him “Walker” because he used to walk to school and everywhere else in South Bend and also because his stepfather’s last name was Walker. He first was introduced to the saxophone in his teens through South Bend sax player George Mason. Soon Junior had his own sax and learned to play well by practicing along with records by Boots Randolph and jazz artists like Stan Getz, Charlie Parker, Lester Young, and Illinois Jacquet from whose recordings he learned to play that high “G” note on his saxophone. After high school, Junior put together a band called the Jumping Jacks and went professional playing small clubs, school proms, and teen dances. Even in these early years, Junior was playing his signature “G” note on his sax and wowing his audiences in the process. After a few years paying his dues in South Bend, Junior had put together a top-notch band that included guitarist Willie Woods, organist Victor Thomas (who also supplied the bass with his foot pedals), and drummer Tony Washington. Now calling their quartet Jr. Walker & The All Stars, the entire band moved to Michigan after they had lined up an open-ended gig at a nightclub in Battle Creek called the El Grotto. Although the band played both jazz and R&B, it was R&B that packed the club. Junior developed into quite the showman at the El Grotto playing on the bar, blowing his sax on his back or from his knees, or doing the duck walk, as he and the band regularly tore down the house. A young Al Green, who performed with a Grand Rapids vocal group called the Creations at the El Grotto, learned some early lessons about how to work a crowd from watching Jr. Walker & The All Stars play there. The man who would discover Junior and play an important role in his career at Motown was Johnny Bristol. When Bristol saw Jr. Walker & The All Stars at the El Grotto, he was recording as part of the duo Johnny & Jackey (with Jackey Beavers) on Harvey Fuqua’s Tri-Phi label out of Detroit. Bristol immediately saw Junior’s potential and convinced him to come to Detroit and meet Fuqua and his partner Gwen Gordy. Harvey Fuqua, who was a former vocalist with the Moonglows, and Gwen Gordy (Berry’s sister) had an interesting roster of artists on their Harvey and Tri-Phi labels. Besides Johnny & Jackey, they had also signed the Spinners, Shorty Long, and future Marvelette, Anne Bogan. All of these artists would eventually record at Motown. In addition, it was Fuqua who brought Marvin Gaye to Michigan and helped to get him signed to Motown. Jr. Walker & The All Stars were signed to the Harvey label in late 1961 and their debut recording featuring the instrumentals, “Twist Lackawanna/Willie’s Blues”, was released in January of 1962. Harvey issued two more instrumental 45’s, “Cleo’s Mood/Brainwasher Pt. 1” and “Good Rockin’/Brainwasher Pt. 2” before the record company folded because of money problems. The company was then purchased by Berry Gordy and was merged with Motown in late 1963. As a result, Junior followed Harvey Fuqua to Motown along with both the Spinners and Shorty Long. Soul was to become the fourth major label within the Motown family, and its first single was Shorty Long’s “Devil With The Blue Dress” in the spring of 1964. Berry Gordy himself produced Jr. Walker & The All Stars’ debut instrumentals for the label, “Monkey Jump/Satan’s Blues”, in August of 1964. Unfortunately, the record failed to hit, and Junior was soon back to playing the El Grotto. It was at the club, however, that Walker found the inspiration for what proved to be his breakout song. One night he became intrigued by a dance where the participants were employing moves that imitated shooting a gun. When he asked one of the girls doing the dance what it was called, she said it was the ‘Shotgun’ and told him that he should write a tune for it. In 1964, Motown was still a small enough organization that an artist could phone Berry Gordy directly to discuss a recording. After Junior had penned his “Shotgun” song, he called Gordy and explained to him that he had written a tune based on a new dance. Gordy liked the idea and had Junior and the band drive over to the Motown studio to record it late in 1964. The session, however, had its problems. First of all, Junior had written lyrics for “Shotgun” and had invited former Jumping Jacks’ pianist and vocalist Fred Paton to the session to sing them. When Paton failed to show up, Walker himself was reluctantly pressed into service as the vocalist. Secondly, drummer Tony Washington couldn’t find the right groove for the song, and the Funk Brothers’ Benny Benjamin had to be called in to drum on the recording. “Shotgun” was an immediate smash hit when it was released in early 1965. The song spent four weeks at # 1 on the R&B charts and peaked at # 4 on the Hot 100. With new drummer James Graves, Jr. Walker & The All Stars appeared on Shindig, Hullabaloo, and American Bandstand playing their big hit and getting lots of national television exposure in the process. For the follow-up single, Junior penned another dance-floor tune called “Do The Boomerang”. Released in the summer of 1965, the song reached # 10 on the R&B charts and # 36 on the Hot 100. The summer of 1965 was good to Jr. Walker & The All Stars as their third single became a two-sided hit with both “Shake And Fingerpop” and its flip, “Cleo’s Back”, appearing on both the R&B charts and the Hot 100. In addition, Motown released the “Shotgun” album that contained all their hit singles as well as some interesting band instrumentals. Motown put out one of Junior’s instrumentals, originally recorded for the Harvey label in 1962, as the band’s first single of 1966. “Cleo’s Mood” was only a minor success, however, and Walker decided to change his formula somewhat for his next single. Since Jr. Walker and The All Stars were a hard-working road band, their time in the Motown studio was usually brief. Holland-Dozier-Holland, the label’s hottest writing and production team, had written a song specifically for Junior called “(I’m A) Roadrunner”. The band recorded the song in between road trips, and when the song was released in the spring of 1965, it became Junior’s biggest hit since “Shotgun” reaching # 4 on the R&B charts and # 20 on the Hot 100. The follow-up single, a reworking of Marvin Gaye’s hit “How Sweet It Is (To Be Loved By You)”, was an even bigger hit as it peaked at # 3 R&B and # 18 on the Hot 100. After the song had been recorded, producers Johnny Bristol and Harvey Fuqua added voices in the background to give the recording a party-like atmosphere. Motown tried the same approach on Jr. Walker & The All Stars’ final single of 1966, a cover of Barrett Strong’s “Money”. Apparently it was too much of a good thing, as the single was only a minor success. Jr. Walker & The All Stars seemed to be treading water in 1967. The first two singles of the year, “Pucker Up Buttercup” and “Shoot Your Shot”, were both taken from earlier albums. The band’s biggest success was with a reworking of the Supremes’ hit, “Come See About Me”. Released in December of 1967, the song peaked at # 8 on the R&B charts and reached # 24 on the Hot 100 after the first of the year. 1968 saw only one other chart hit for the band. “Hip City Pt. 1/Hip City Pt. 2” was a James Brown-inspired two-sided travelogue song that again used the fake live setting that was so successful on “How Sweet It Is” two years earlier. “Hip City Pt. 2” became the hit as it peaked at # 7 on the R&B charts and # 31 on the Hot 100. By 1969, all production duties on recordings by Jr. Walker & The All Stars had been taken over by Johnny Bristol. Bristol felt that Junior needed a new direction and had been pestering him to record a mid-tempo ballad called “What Does It Take (To Win Your Love)” for almost a year. When Junior finally relented, Bristol employed a female backing group and replaced the All Stars’ signature organ with strings. He also sang harmony on the recording since Junior was filled with doubt about his ability to sing this type of material. The song made its initial appearance on the “Home Cookin’” album. Many people at Motown, including Berry Gordy, weren’t happy with this new sound. They were reluctant to see Jr. Walker & The All Stars deviate from the formula that had so successful the past four years. Gordy, however, soon warmed to the song and pressed a single that was released in May of 1969. Bristol’s instinct was proved right as “What Does It Take (To Win Your Love)” became Jr. Walker & The All Stars’ second # 1 R&B single and the band’s biggest success on the Hot 100 since “Shotgun”. Bristol would work exclusively as Junior’s producer for the next three years. It would also signal the end of the All Stars as a self-contained recording unit. Although some may feel that the recordings done under this new arrangement were not up to what the band had recorded prior to 1969, it would be hard to argue with the chart success that Jr. Walker & The All Stars enjoyed in 1969 and 1970. Junior covered the Guess Who’s hit ballad “These Eyes” just months after it was a Top Ten hit and took to # 3 on the R&B charts and # 16 on the Hot 100. Next up was “Gotta Hold On To This Feeling” which reached # 2 on the R&B charts and # 21 on the Hot 100. Bristol then reached back to a song he had first cut back in 1962 on the Tri-Phi label as part of Johnny & Jackey. “Do You See My Love (For You Growing)” was another monster hit for Jr. Walker & The All Stars, reaching # 3 on the R&B charts and peaking at # 32 on the Hot 100. Johnny Bristol selected another old Johnny & Jackey tune called “Carry Your Own Load” for Junior’s first single of 1971. Its flip was a rather uninspired cover of Neil Diamond’s “Holly Holy”. Airplay was split between the two songs, however, and neither achieved much chart success. At this time, Motown was beginning to switch its operations from Detroit to Los Angeles, and this also seemed to signal the demise of some of the label’s most successful artists of the 1960’s. Junior Walker & The All Stars placed three more hits on the Hot 100 into 1972. “Take Me Girl, I’m Ready”, “Way Back Home”, and “Walk In The Night” were all minor hits, but the end was near as the band would never again return to the Hot 100. The All Stars fared a little better on the R&B charts with those singles, and “Walk In The Night” even put Junior and the band back in the R&B Top Ten for the final time in 1972. Jr. Walker & The All Stars continued to record for Motown through most of the 1970’s but with little success. Finally near the end of the decade, Junior left Motown and signed with Norman Whitfield’s new self-named label. It was on Whitfield that Jr. Walker & The All Stars made their final R&B chart appearance with a minor hit called “Wishing On A Star” in 1979. Junior found himself back in the public eye again in the new decade as a sideman when he played a memorable sax solo on Foreigner’s big 1981 hit, “Urgent”. This success led to his resigning with Motown for one last album, 1983’s “Blow The House Down”. 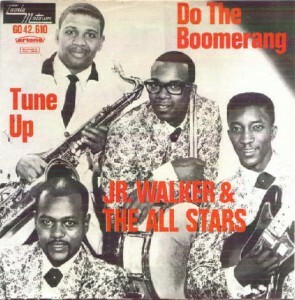 Junior Walker & the All Stars continued as a hard-working road band right up until Walker died of cancer in 1995. Following The deaths of both Junior and Willie Woods, fellow original members Tony Washington and Victor Thomas continued performing as Jr. Walker’s All Star Band along with Kenny Walker and Acklee King. The band is augmented in concert by a trio of female vocalists affectionally billed as “The Ladeez”. Despite being an inspiration to legions of sax players, charting 26 R&B hits, and placing 21 singles in the Hot 100, Junior Walker & The All Stars have yet to be inducted into the Rock and Roll Hall of Fame. The band was honored in 2002 when “Shotgun” was inducted into the Grammy Hall of Fame. 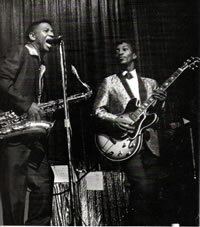 In 2007, Jr. Walker & The All Stars were voted into Michigan Rock and Roll Legends. “Shotgun” was voted a Legendary Michigan Song in 2010. “Jr. 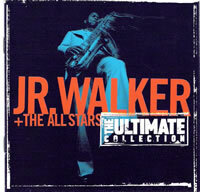 Walker & The All Stars: The Ultimate Collection”. Motown CD. This is another great entry in Motown’s Ultimate Collection series. The 25 songs contain all the hits as well as a couple of instrumentals (“Twist Lackawanna” and “Cleo’s Mood”) that were originally recorded on the Harvey label and then re-released on Soul.